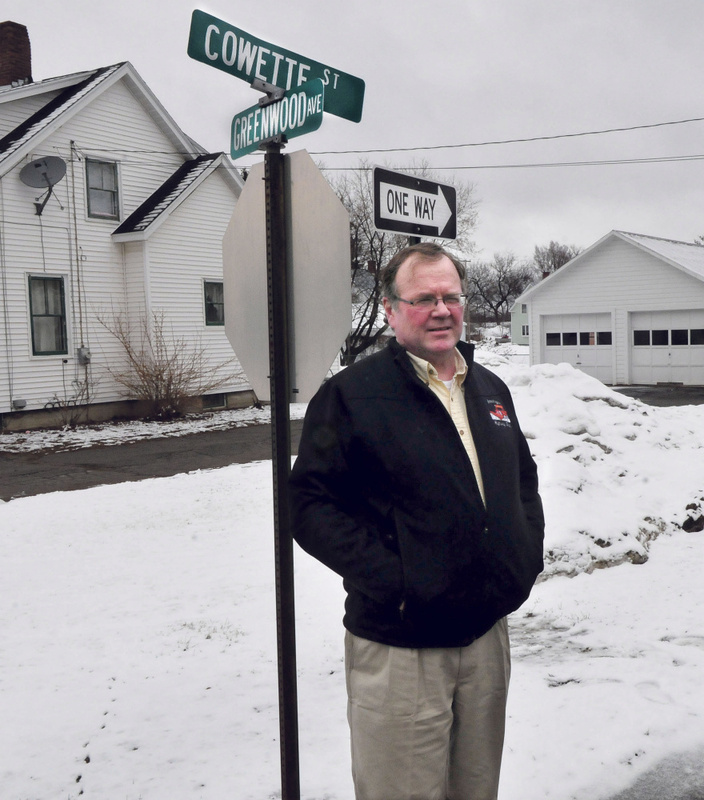 Gem and Cowette streets will become one-way from Madison Avenue in an attempt by town officials to reduce speeding and traffic flow in the residential area. 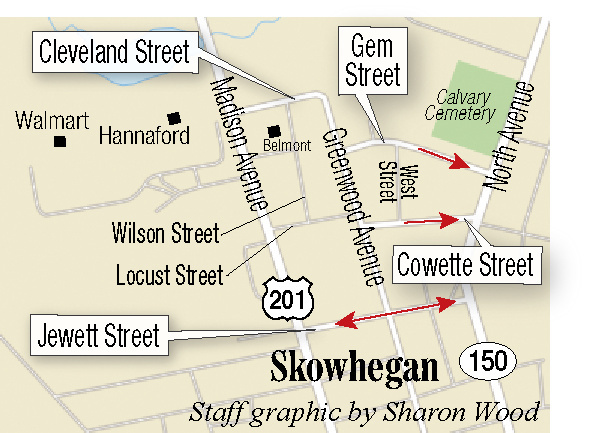 SKOWHEGAN — No more shortcuts from North Avenue to Madison Avenue in Skowhegan. As of Monday, April 17, Gem Street and Cowette Street will be one-way from Madison Avenue — where they meet Greenwood Avenue and Cleveland Street, next to the Belmont Motel and across from the Hannaford supermarket — to North Avenue. Speeding and traffic congestion have prompted complaints from residents in the neighborhood, so town officials are taking action. That means an estimated 20,000 cars and trucks per week will have to use Jewett Street to connect from North Avenue to the town’s two major arteries, either coming south from Cornville and Athens, or north from the downtown business district. The area that includes West Street, Locust Street and Wilson Street is a residential subdivision, not meant to be a shortcut across town, said Skowhegan Road Commissioner Greg Dore and Town Manager Christine Almand. Dore said his department did a traffic count and found that 11,449 cars and light trucks used Gem Street in both directions over the course of one week to get to one side of town or the other. He said 34 percent of those motorists were exceeding the speed limit. About 5,500 cars were counted on Cowette Street that week. John Matthews, who has lived on Cowette Street since 1970, where he raised his children, said he is hopeful the changes to one-way will work, but he’s not convinced they will. Matthews said he and his neighbor, Mark Bedard, who grew up with Matthews’ children on Cowette Street, have attended a couple of the selectmen’s meetings to discuss traffic and solutions. He said Bedard and his children played in the street when they were little, but there was little traffic in those days. So what changed the quiet neighborhood to a traffic freeway? “The Wal-Mart,” Matthews said. “Shop ‘n Save and Wal-Mart over there, the minute that place opened up the traffic just picked up.” He said people “don’t want to mess” with Madison Avenue and the stop lights near Rite Aid, which often are not working properly. Matthews said the diverted traffic also could cause a problem on Jewett Street, where North Elementary School is located. Dore said he agrees that traffic on Jewett Street could be a concern, but it was designed as a collector street and should be able to handle the increase in traffic. He said he also agrees with Matthews that the arrival of Wal-Mart and Shop ‘n Save (now Hannaford) in 1993 contributed to the change in traffic patterns in Skowhegan. Carol Pike, who owns and operates Cam’s Nails on Gem Street, said she doesn’t want the streets to become one-way. She said the change only will make the problem worse than it is now and possibly hurt her business. She said if her street is one-way, it will make drivers go even faster, not having to worry about traffic coming from the other direction. She said a better solution would be speed limit signs and even cameras to catch speeders and give them a ticket. In all, 13 signs will be unveiled April 17. The signs — some saying “One way,” others saying “Do not enter,” were installed this week, though plastic bags are covering them for now. Almand said the Board of Selectmen wanted to do a trial period to see if the new system is going to work. They expect to have a public hearing on the matter sometime in May. “It’s possible it could be temporary,” Almand said. Complaints about traffic and speeding cars on the two side streets have been coming in for years, Dore said. Interim police Chief Joel Cummings said the fine for going the wrong way down a one-way street is $165 with a conviction in court. Dore said the streets within the subdivision are not designed to be collector streets; they are residential streets designed to be used by the people who live there. 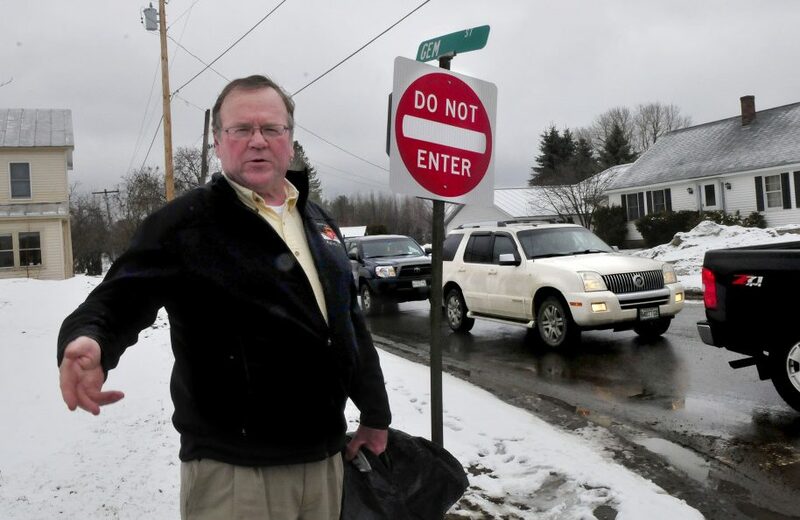 A lot of people use them as a shortcut to get to Wal-Mart, he said, but among the sign changes will be a “no left turn” sign at Cleveland Street and Madison Avenue, toward Fairgrounds Market Place, where Wal-Mart and Hannaford are. Any changes in traffic patterns in town are going to bring out people who like the idea and people who don’t, Dore said. Many people use the shortcuts as part of their regular route, he said. Dore and Almand said they already have had calls for and against the changes. Selectmen may address the issue at their next meeting, which is scheduled for 5:30 p.m. Tuesday.